We have included this section despite none of the metrics being relevant to account performance, because it can assist you in understanding what work is being undertaken in an account. If your account is managed externally or by anyone other than yourself; you can see what changes have been made by looking at the ‘Change History’. We only provide brief explanations for each as they are very rarely used and they provide no insight into account performance. 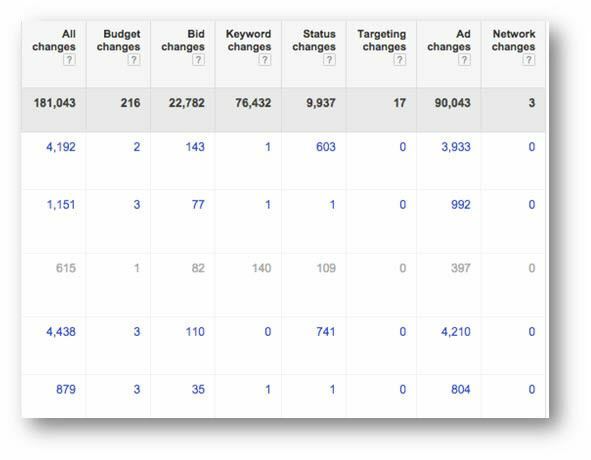 All of the below changes when viewed in AdWords online, have clickable statistics that will take you through to the change history report specific to that stat for that campaign (see screenshot below). The blue numbers in the above image are clickable links.